Customized Group Travel is for groups of music lovers who want a specially constructed trip just for them. Such a trip can be for alumni associations, patron groups from orchestras or opera associations, choral societies, universities or high schools, radio stations, or just a group of family and friends. The Beethovenhaus Museum in Baden has the only one of the composer’s apartments that can be visited today. An unparalleled possibility would be a private concert just for our group. This would be in the magnificent central hall of Vienna’s Collection of Ancient Musical Instruments and would be a chamber music performance on one of the collection’s historic instruments, perhaps a piano owned by Brahms or Mahler, or Leopold Mozart’s violin. The director of the collection (a good friend of Dr. Nelson) would also give the group a private tour of the museum. 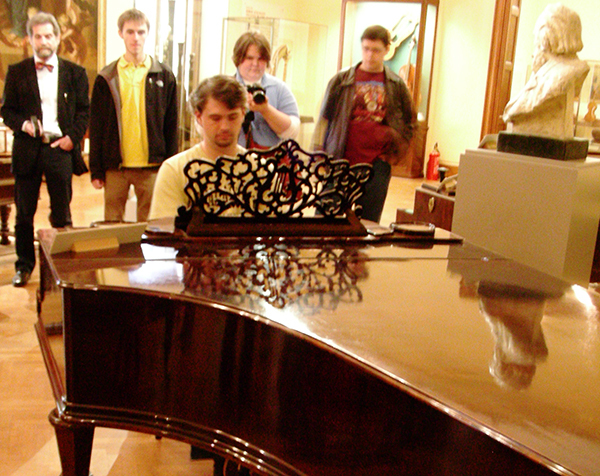 Dr. Nelson can sometimes get groups into to private rehearsals. 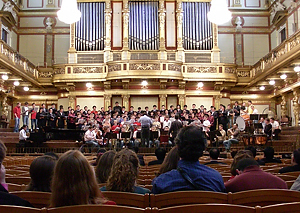 Here we are listening to a rehearsal of the Vienna Boys Choir with a guest chorus. For all custom trips, Dr. Nelson can travel to meet with the group before the trip for orientation and planning meetings, and for any educational sessions that are desired. For school groups, he recommends about six hours of pre-trip sessions over a one- or two-day period. Click here to see some of the details that will be covered. There is great flexibility in planning a customized trip, and Dr. Nelson would work closely with the group to choose the best possible cities, dates, itinerary, and budget. 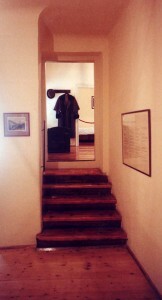 In Mozart’s Footsteps can also arrange for discounted group air travel. And, of course, Dr. Nelson would personally lead the entire trip. Contact us for price quotes and for more information. 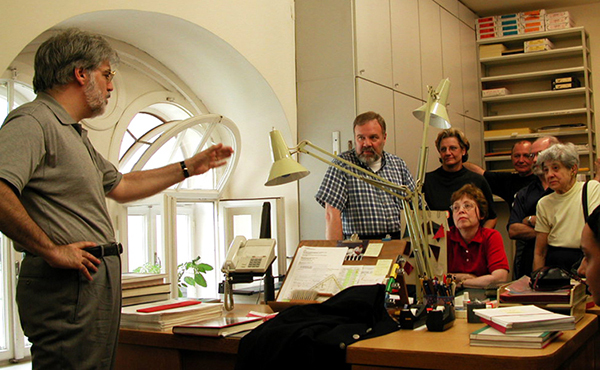 Dr. Rudolf Hopfner (left), Director of Vienna’s Collection of Ancient Musical Instruments and a friend of Dr. Nelson, lets Robert play Brahm’s piano which is usually off limits to visitors.